The Crank Room is a room inside of the Old Clockworks in Luigi's Mansion: Dark Moon. The Crank Room is only accessed by taking the north door inside of the Maintenance Hub. The Crank Room is a large room with huge gears making up a majority of the area. Luigi can walk on these gears and even walk between the teeth to get onto higher places. There are several walkways between the gears where mice scurry along. At the far north side is an area with lockers. The door to the south leads back to the Maintenance Hub. During C-5: Piece at Last, Luigi must go to the Crank Room in order to find a key to gain entrance to the Synchro Gantry. Upon entering the room, Luigi must first reveal a missing gear at the bottom of the room by using the Dark-Light Device. 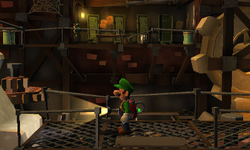 This causes the rest of the gears and cogs in the room to move, giving Luigi access to the area with Slammers. After defeating the Slammers, the key is found inside one of the lockers. This mission's Boo is found on the far left side behind a sheet of wallpaper that can be pulled off. The Boo is inside the Treasure Chest. A Gold Greenie is also hiding in the second locker to the left after the Slammers have been captured. This page was last edited on May 1, 2017, at 21:25.